You have now done all your research, found your true match and are ready to bring your new fur-kid home. Did you realize it can take anywhere from two days to two months for your new pup to adjust to it’s new home? Not only that, but it can take a new dog owner that same amount of time to adjust their lifestyle to a new pup. The following 10 tips can help ensure a smooth transition. The main thing to remember: the key to helping your new pup make a successful adjustment to your home is being prepared and being patient. 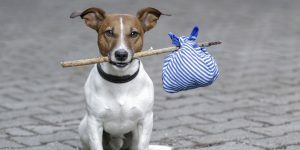 Prepare the things your dog will need in advance. We have prepared a great list of the 10 Essential Items that you’ll need. The real basics are a collar, leash, food and water bowls…oh and maybe a toy. And you’ll probably want to order some ID tags, just in case your pup decided to wander off. 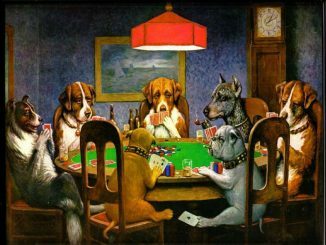 We all have busy schedules and things are constantly changing, but just imagine the confusion for a new pup if rules keep changing. 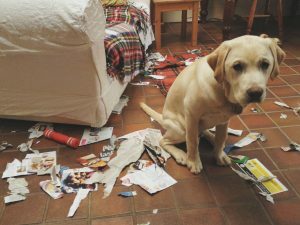 Take a little time to work out your dog care guidelines in advance among all the hoomans of your household. 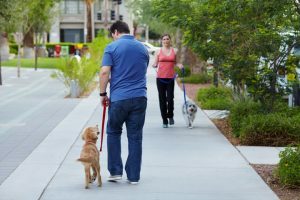 Who has walking responsibilities and when? Where will she sleep at night? Who will feed your new ball of fur and on what schedule? Is Fido allowed on the couch? Who is getting up at night for the mid-night pee run? Are there any rooms off-limits? 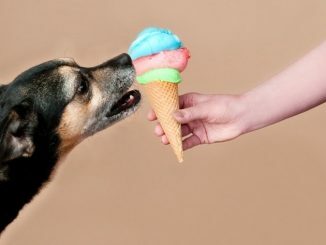 Don’t wait too long on this, because your pup will form habits very quickly and push boundaries, and once that happens….well, good luck changing that. 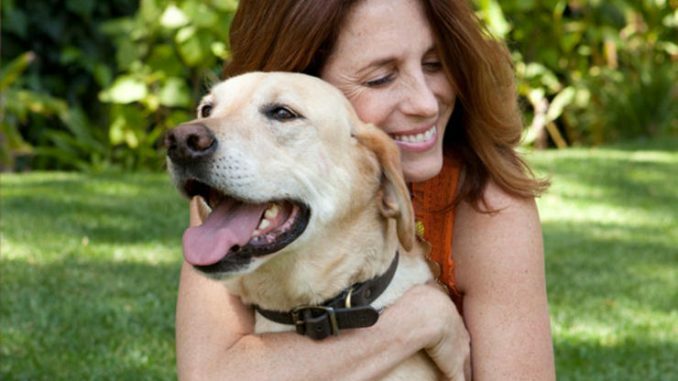 This one can’t be stressed enough, because this may be the most stressful thing for you, your family and your new pup. Try to arrange the arrival of your new pup for when you can be home for a few days. If you work during the week, then a weekend is the right time. You will need to get to know each other quickly, so plan to spend some quality time together. 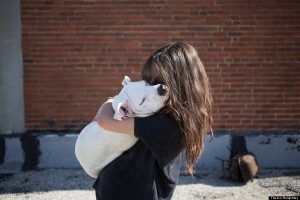 Your pup may have separation anxiety from their old environment, especially if they are coming from a breeder, or had been in foster care for a while. Also, don’t forget that animals can get jealous, so make sure you don’t neglect other pets in your household! Even if you are getting a rescue, assume your new pup is not housetrained. This means you need to start this process quickly to avoid accidents and frustration. Look, sh*ts gonna happen, but with some careful planning and quick action, you can set the stage for less of it. The Human Society has created some great resources to help you with housetraining tips for puppies or adult dogs. The main goals are to be consistent and maintain a routine. 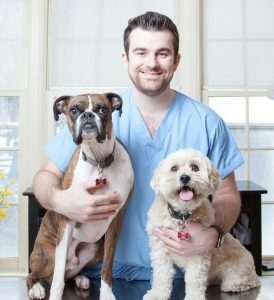 You should book an appointment with a veterinarian for the first week after bringing your pup home. If you don’t have a vet, you can check out resources like Bark ‘n Yapp to find one close to you. If you have a new puppy, then there are some early shots that will be required before they are aloud to start meeting and greeting other pups in your neighbourhood or even start to explore their surroundings. This is a crucial time for a pup, so don’t put this off! If you are adopting, then you will also want to make sure you bring your new pup in for a “once over” with a veterinarian fairly quickly. This first appointment will help to establish a baseline on your pup’s health and any needed vaccinations. If your adopted pup was not spayed or neutered by the agency, then you should make that appointment to have this done. It is usually a requirement of adoption. If you need more information about why it is so important to spay or neuter your dog, read our online information on here. 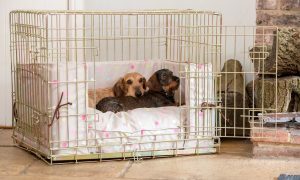 Dog’s instinctively like a den, so a crate may appear to you to be like a jail cell, but to a pup, it’s really their own home. Crate training is so important easy with your pup. Not only does it make housetraining and obedience-training easier, it also allows for safer transportation and quiet place for your pup to get some peace and quiet. It is very hard to crate train an older dog, so starting early is critical and will save you many headaches throughout your pup’s life. Remember, a crate is meant to be a good place your your pup. Try not to keep your pup locked in for too long, or they might start to see it as a jail cell. A few hours a day on a regular schedule should work well, or over night will really help with housetraining. If a crate isn’t an option, consider a pen or gates in your house as a confinement system. One safety factor to remember is that your pup should not have a collar, especially with ID tags, on while in a crate. Collars and tags can get caught on any wire openings an create a choking hazard. 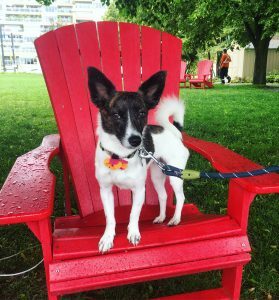 The should allow enough room for you pup to stand up, turn around, and sit comfortably in normal posture. You can find more information on crate training here. As much as we want to spoil our fur-kids, they need some law and order. You need to let Fido know you are the boss right from the start. When you catch him doing something he shouldn’t, don’t lose your cool. Stay calm, and let him know immediately in disapproving voice that the behaviour is unacceptable. At the same time, reward training is a great way to let you pup know when they have done well. Praise, treat, praise when they do something well! Sign up for a local dog obedience class as soon as you can. You’ll learn what a joy it is to have a well-trained dog. What’s the old saying, a tired pup is a happy pup? That means tired both physically and mentally my friends. Dogs need an active life. You should plan plenty of exercise and game time for your pup. If you are dealing with a new puppy, then start with mental games first, You pup will need to develop some muscles and bone density before you start running them in the off-leash park. For older rescues, start to build their exercise into yours. If running around the park is too energetic for your taste, try throwing a ball or a stick, or just going for a long walk together. If they don’t know how to play fetch, maybe it’s you not them. 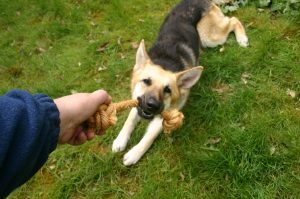 Check out Teaching Fetch to Your Owner. Whatever you choose to do, make it a regular thing. It will enhance both of your lives, I promise. All dog owners have been there. We get mad at our new pups for chewing our favourite shoes, or destroying a carpet. Look, pups are curious creatures and in most cases, we realize later that it was our fault for leaving something out for them. Before bringing your new pup home, do some pre-planning to not only protect your “stuff” but to protect your pup. Making minor adjustments around the house can help avoid major catastrophes. This may seem silly, but try getting down to your pup’s level. Take a minute to get on all fours and see the world from their vantage point and you might see lots of dangers and curiosities. Look for things your pup could chew on or get tangled in. Are there small spaces that seem like fun places to explore but impossible to get out of? Above all, be reasonable in your expectations. Whether this is your first pup or your 10th, every dog is different. Remember that life with you is a different experience, so give your new fur-kid time to adjust. This isn’t Tinder. The ultimate goal is to make a friend for life. Done right, nobody will ever greet you with as much enthusiasm or provide you with as much unqualified love and loyalty as your pup, so don’t rush it will. Be patient, and you will reap the rewards. 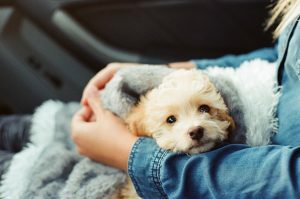 Although this is not an exhaustive list, we do hope it will help you plan for the arrival of your pup and put you on the path to an outstanding life with your new “best friend”. If there are any other tips you want to share, please comment below. We always love to hear from our loyal pup parents.